In 1919 Alcock and Brown made the first non-stop one way crossing of the Atlantic by air, in a converted Vickers Vimy bomber aircraft, followed a few weeks later by the airship R-34's flight from East Fortune, in Scotland to New York and back. For the powers to be the airship was the only means of providing long distance travel. In 1923 Vickers Ltd. put forward a proposal to the Conservative Government, of the day that, they would build and operate six airships on the Empire routes. Before this proposal could be agreed and signed the Labour Government came to power and the proposal was stopped. The new Prime Minister, Ramsey Mc.Donald, appointed a Cabinet Committee to investigate the whole airship matter and decide a course of action. The result of the investigation was, rather than put the whole airship industry in the hands of private enterprise, the State, in the form of the Air Ministry, who had personnel, some of whom had been involved with the R38/ZR2, and considered that no one knew more about airship design than they did, would build an airship, to be called the R101 at Cardington. While the Airship Guarantee Company, a subsidiary of Vickers Ltd. would build another airship, the R100 to the same contract specifications. The Airship Guarantee Company decided to build the R100 at Howden. Vickers brought back, from abroad Barnes Wallis to head the design team, because of his success with the R80. Nevil Shute Norway (Nevil Shute the famous author) was to be the Chief Calculator, who had the daunting task of checking the stress loading on the framework of the airship, something that had not been correctly addressed on the R38/ZR2, and was to be repeated on the R101. In 1924 the Airship Guarantee Company sent a working party to Howden to put the now derelict airship station back into service. The massive shed still stood surrounded by debris of the wartime blimp sheds. The owners had abandoned it in the face of falling scrap metal prices. The door clearance of 130ft. (40 meters) had to be increased by 10ft to accommodate the R 100. Once more Howden was back on the map. The town's fortunes took an upward turn as a large labour force, mainly recruited locally (60% of the labour on airship construction was female) was needed not only to rebuild and run the station, but to construct a giant airship, which was to measure 709 feet (216 meters) in length, nearly as long as the Ocean going liners of the day, 130 feet (40 meters) in diameter, a 5,000,000 cubic foot displacement and powered by six Rolls-Royce engines, producing 4,200hp. The wages being paid at the time were £4 a week for a foreman such as Mr. B. Nichols, while a worker such as Harry Wilson from Goole would collect approximately £2.15 shillings for a 47 hour 6 day week. A rail ticket, round trip from Hull was 10 shillings a week, Hull to North Howden station on the London North-Eastern Railway. Over the following six years the two airships took shape. In Nevil Shute’s book, 'Slide Rule', he describes how the rivalry between the two teams building the R100 and R101, meant there was no exchange of information, leaving each team to solve their own problems. With the result that the R101’s team, who had the greater resources, tended to build in equipment which was not really essential and led to the airship being a lot heavier than the R100. One example of this was the R101 carried a spare engine, only to be used in the docking action that occupied only a few minutes at the end of each flight. The rivalry between the two teams continued, being fed, by the knowledge that only one team would survive, that would be the team who produced the best airship. 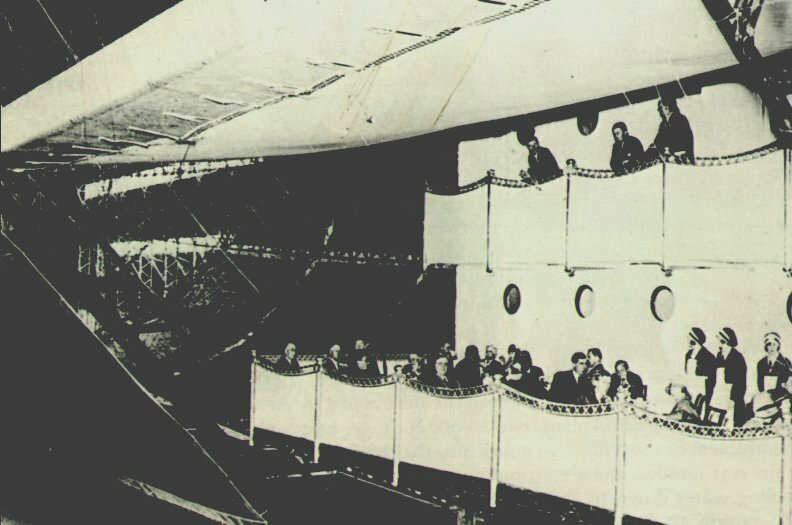 Most of the press coverage of the day was about the R101, but in 1928 more than fifty MPs, businessmen and Government Officials were treated to a tea party in the passenger compartment of the unfinished R100, the waitresses being recruited from the fabric shop. The R100 passenger accommodation consisted of a coach situated some 180 ft. from the bow. Mounted inside the hull of the airship. The coach consisted of three floors. Two floors for the passengers. 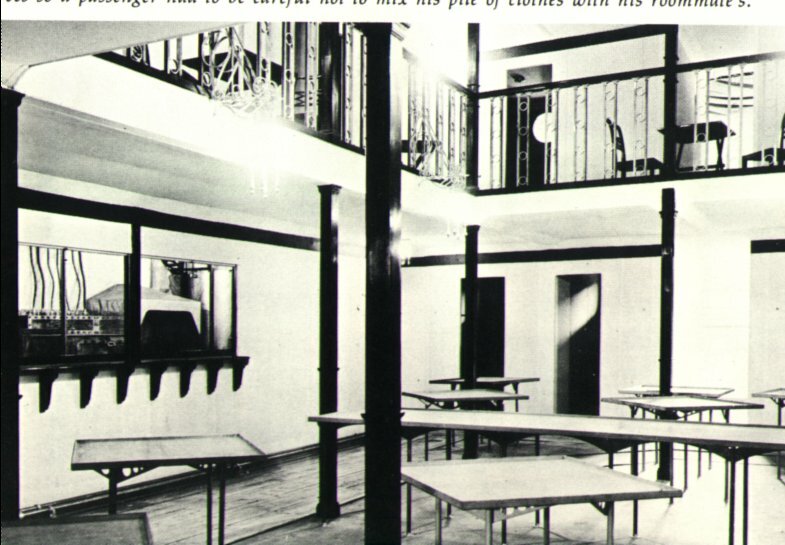 The third and lower floor housed the crew. Cooking facilities were available in an electric kitchen. Passenger comfort was rated between Pullman and Ocean going liner, with two and four berths cabins. Windows in the side of the ship provided light and view and the promenades provided enough space to hold a small dance. The R100 was nicked-named the ‘The Cupid Airship’ because 20 workers were married to local girls during the construction. In the early hours of the 16th. December 1929, Nevil Shute set off from his lodgings in Hailgate Howden, to make his way to the airship station. The country roads around the town were choked with coaches transporting the 500-army personnel, who would provide the ground handling party, needed to walk the giant airship from the shed, ready for its first flight. The troops came from Beverley, Pontefract and the Lancaster Regiment from York. By 07.15 a.m. the crew were on-board and the R100 took to the skies. After completing a few circuits of Howden and being satisfied that all was well, the airship headed for York. Following a few circuits of the Minister and York itself the airship set course for its future base at Cardington in Bedfordshire. After completing its flying trials the R100 made a successful proving flight to Canada and back to Cardington. Meanwhile the R101, had flown first in October 1929, but the design team were forced to carry out many modifications, mainly to try and reduce the weight of the airship. Possibly prompted by the success of the R100’s uneventful flight to Canada it was decided the R101 would fly to India, carrying Lord Thompson, the then Secretary for Air, even though the airship had by no means completed enough trial flights, which seemed to have been apparent to all but the Air Ministry. The R101 set off from Cardington on October 4th. 1930, ignoring the weather forecast, it flew into a mini storm and crashed in Northern France. All but six were killed from the fifty-four souls on board, Lord Thompson being one of those killed. As a result of the loss of the R101 all airship production in Britain was stopped. The R100 was steam rollered and sold for scrap. All future money and technology was transferred to the design and development of the aeroplane. Once again the Howden Air Station was left to run down and the town's fortunes with it. The town still survives, but the airship station is no more.